Remember those old school Super Mario games, where if you stood still too long the edge of the screen would start to push you forward? Even if you tried to run backwards, the scene would just keep marching on at a steady, unrelenting pace. I’m not sure I’ve ever fully appreciated what a great analogy that is for life, until this very moment. Here I am, two days away from getting on a plane, and I’m furiously digging my heels in, pushing back on the edge of the screen and hoping for just a few more hours in this day. But time, as it’s wont to do, marches on, and the scene progress. Ready or not, the Games are coming. Now I realize that probably all sounds quite dramatic. And it’s not that I’m not beyond excited at the prospect of landing in jolly old England before the week is through. I’m beside-myself excited. I’m giddy. I’m downright intolerably happy most of the time. What I’m not excited about is arriving in London with a hot mess of the wrinkliest clothes in the world because I ran out of time to finish laundry and packing and OMG I haven’t ordered my Dubarrys yet and WHERE HAVE ALL MY SOCKS GONE? I KNOW I OWN SOCKS!! Want to know the secretly hilarious part? As dramatic as I’m being about the timing, and as tight as the timing truly is, in true SmartPak fashion, we’re still making time for all the fun stuff in life. 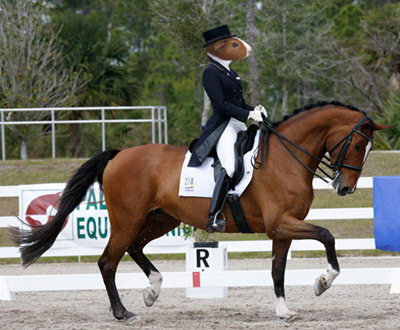 I spent a decent chunk of time today working on lyrics and choreography for a top-secret upcoming video shoot (more on that later…) and managed to find some time to coerce our Director of New Media to Photoshop a guinea pig’s head on to a dressage rider’s body (what?! that totally counts as “new media”). 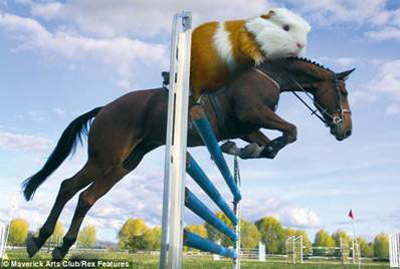 That’s fine, no big deal, just a shot of a guinea pig jumping out in the Grand Prix field. Too bad about the rail, but other than that, nothing to see. And so ends one of the last distractions I had lined up for the day. I suppose now there’s nothing left to do but face the music and start the packing. Oh, and probably buy some socks. A. Most of we now,sorry indoor types call the program GMA. Perhaps one of our spokespersons should call the Asst. Producer of programming. I feel that a well turned out pair such as those pictured should be given air time. I like the way you think, Cathleen. If you’d be willing to help our cause, we’d be much obliged. I saw this story on GMA and actually took the time to rewind the DVR to make sure I really saw what I thought I saw! Good job on the correction. Where’s the HELMET?!?! You guys missed a good chance to promote safety. Hi Lauren – you can absolutely use our photo on your blog, please just give us a link back to Facebook.com/SmartPakEquine and a shout-out to my London Twitter coverage @SmartPakerSarah. 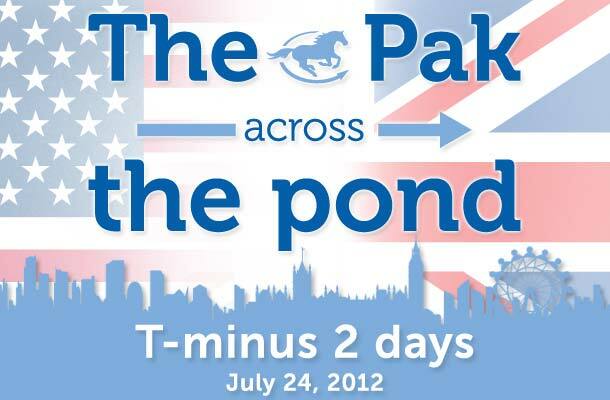 Lots of giggles for us equestrian minded. I assure you there were lots of giggles in the editing process, too!